There are a set of desperadoes in Missouri known as the James and Younger brothers. They live by robbing railroad trains, stages, stores, banks and individuals, and are known to have killed a large number of men. During the war they were bushwhackers, and now their old comrades in arms, aid them to escape arrest. The James brothers live not far from Kansas City, and being surrounded by friends and sympathizers, have thus far escaped. Last week, however, an attack was made on their mother's house, in which they were supposed to be stopping, and a desperate fight ensued, in the course of which a something was exploded, shattering the arm of Mrs. Samuels (the mother) and killing a ten year old son. She and her husband represented that the men sought for were not there, and that the house was fired and a hand grenade thrown in among women and children, but a variety of circumstances go to show that their version is not correct. The probabilities are that some of Pinkerton's detectives, incensed at the murder of their comrades, by these scoundrels, and ascertaining they were at home, made a decent for the purpose of capturing them. It is feared that they did not succeed and it is probably that they will ultimately be killed but never taken. "Men of Missouri, you who fought under Anderson. Quantrelle, Todd, Poole and the balance of the borderers and guerrillas, you who live in Clay county, and Jackson, and wherever these detectives have to leave the railroad to go into the country, recall your woodcraft and give up these scoundrels to the Henry rifle or the Colt's revolver. It is not for the robberies they are accused of that Pinkerton hates the James brothers. It is because like you, they were at Lawrence and Centralia, and Fort Lincoln, and upon the Canadian, and wherever else the black flag floated and men neither knew nor wanted quarter." What is to be thought of a state that will support a paper which expresses such atrocious sentiments? Its editors and proprietors should be sent to the penitentiary for incity to murder. I began driving during high school in Independence, Missouri, during the mid 1950s. Many Sunday dates were spent just driving several hours in the country and stopping somewhere to have a coke or a hamburger. My girl friend and I were both sixteen years old. We had just about driven Jackson County out over so many Sundays, so we ventured north into Clay County to see if the countryside was any different. On one Sunday we drove down a lonely unmarked dusty road and passed a locked gate with a sign that said “James Farm.” A long dirt roadway leading from the gate disappeared into a hilly area. We kind of wondered if we might have stumbled onto the Jesse James place but we kept driving and soon forgot about it. Several weeks later we drove down the same road and the gate was open. We decided to drive in and see what we might find. We were very apprehensive and thought we might be unwelcome guests at wherever we were going. The house could not be seen from the main road and we drove perhaps a quarter mile until we came to a farmhouse with a fence and a parking area for several vehicles. There were no other cars. A smiling old man came out of the farmhouse to meet us and shook our hands. The first thing we asked was this the Jesse James place? He said it sure was and wondered if we would like to look around. We sure did. This man said he was 79 years old and he was being the personal guide for two sixteen year olds—quite a generation gap. I will never forget how nice he was and how he answered every question we had. Inside the house were all kinds of old stuff from the 19th century including the mirror, shaving gear, and straight edge razor of Jesse, himself. There was also a fragment from the bomb on display. His mother had lost her arm as a result of the explosion. As I recall, the farm had been opened to tourists several years earlier but had been closed down for some time. This man was now trying to open it again. We were the first visitors and there was no charge. We were in an addition added in the 1890s. It was well preserved and housed the James family artifacts. 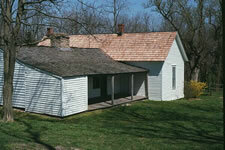 We could not go in the part Jesse and Frank James lived in because that part had been condemned. It was the portion the bomb was thrown in. The man eventually identified himself as Frank James, Junior. We were floored to say the least. No one at school believed we had met Frank James’ son. The bombed portion of the house with its covered porch was not very big and has now been restored. A photo of the house is shown at the top of this page.